The Library at St. Francis is home to hundreds of books on spirituality and religion. The icons in the chapel are hand painted representations of the archangels as well as Jesus and Mary. They represent the Eastern Orthodox tradition. Kay Adair is a co-founder of St. Francis of the Woods Renewal Center, as well as the Kerr Center for Sustainable Agriculture. Chris Contreras is the center's director, as well as an ordained Eastern Orthodox priest. 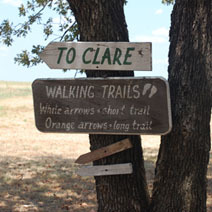 Clare House is one of several cottages available at St. Francis. They can be rented on a short term basis for a suggested donation. As we sit in on the rock wall overlooking the natural beauty of the grounds, Kay Adair shares the story of St. Francis of the Woods Spiritual Renewal Center. Her voice is calm, and her kindness and warmth is palpable. “I believe we are gifted with people we need to learn from – even creatures – horses, birds, dogs, cats. Even into the decade of the eighties.” The youngest daughter of Senator Robert S. Kerr has been on this Earth going into her 82nd year. “When my husband was exploring the land and came across the waterway, it was his spirit that told him it was the right place,” says Kay, referring to her late husband, Bishop Robert Adair, when he was in search of the perfect location for St. Francis. After serving for many years as an Eastern Orthodox priest, Robert felt a spiritual calling to create a poustinia. In the Russian spiritual tradition, this is a simple place of shelter “in times of trouble, transition, or intense spiritual search.” The bit of earth that makes up St. Francis of the Woods today is located just off Highway 33 in Payne county, Oklahoma, between Guthrie and Stillwater. The land is set among nearly 490 acres of pasture, woods, streams, small waterfalls and paths. Many who visit St. Francis have reported feeling a special, healing force on the land, and several visitors have said they believe the land was once sacred grounds to Native Americans. “People to a different degree are sensitive to the spirit of the land. The connection to spirit is really, actually a mystery,” says Kay. After she says this she stops, “I hear frogs,” she whispers. She laughs as she points to a very small frog jumping out of a crack in the stone wall. “Well, it’s going in the right direction,” she says with a chuckle as the miniature reptile makes tiny strides toward the pond. Speaking of spiritual ground in one breath and tiny, jumping frogs in the next doesn’t seem the least incongruent, coming from this woman, in this place. Indeed, the place does have an unusually calm feel to it. When you are quiet, just watching the Canadian geese in the pond, or observing the ants near the rock wall, a feeling of peace alights on you… like a butterfly, or an angel. The trees seem to murmur, the many paths seem to beckon – not to go anywhere in particular, just gently asking you to take the first step. Something here speaks to those who listen. St. Francis of Assisi is the patron saint of animals and the environment, and seemed the natural choice when the time came to name the center in the late 1970’s. And there were many years worth of clues leading up to this choice. Kay recalls as a young woman studying at the Library of Congress when her father was in Washington D.C., and on one such occasion finding a lone book on a table and opening it to reveal the picture and story of St. Francis. “I felt connected to it,” she says. For years, Robert Adair had studied the works of St. Francis and was moved by the writings of one of the most venerated figures in religious history. When Robert and Kay were in the beginning stages of building the center, St. Francis continued knocking: he would appear as random gifts from friends and would appear in the unlikeliest of places when they traveled. To commemorate his respect for St. Francis, Robert ordered a tile of the patron saint of nature from Italy to be placed in the chapel. Robert and Kay felt strongly that the name would attract certain spiritual qualities, and that over time the people who spent time here would manifest those qualities in their lives. There are several structures on the grounds of St. Francis. There is the Learning Center, a two-story building that serves as the community hub, with a lounge, kitchen and large community space for meetings, workshops and meals; a manse, where the director of the center lives; four small cabins, laundry house, chicken house, work shed, a library and a chapel. To this day, the presence of the tile of St. Francis in the entryway of the chapel is a physical reminder of the protective, spiritual force that seems to pervade these grounds. Undoubtedly, the saint is feeling right at home in this “chapel in the woods,” a unique and organic building that seems to have been born from the woods around it. Inside, the chapel reflects the open and accepting spirit of the center: there are beautiful, hand-painted Eastern Orthodox icons, a Methodist cross over a traditional Orthodox alter, a menorah, and an ever-burning candle. “The candle behind the alter is always lit. It represents the eternal spirit of God,” says Kay reverently, as we take in the beauty of the chapel. Currently, the services are held in the Eastern Orthodox tradition, and follow the liturgy of St. John Chrysostom, but Kay stresses that people of all faiths and beliefs are welcome here. From its beginnings, St. Francis was created for the purpose of allowing individuals to get in touch with God in their own, unique way. A place where people are free to question, disagree and discuss, and the many workshops, classes and bible studies held at the center promote this free flow of ideas. The library is also a testament to this philosophy. What began as Robert Adair’s personal library has grown into an impressive collection of literature on the history and practice of as many faiths as there probably exist in the world. Those who seek communion with God through the intellect are abundantly fed here. The roads to St. Francis are as interesting and varied as the people who sojourn here. And once St. Francis makes the call, it doesn’t stop until someone picks up the phone. Some souls are invited by friends or family, some participate in a local church retreat, some, like Director Chris Contreras, see it for the first time while driving by on Highway 33. It was in the early 1980’s when Chris first got wind of St. Francis, and not long after he drove by on his way to Tulsa. He felt very drawn to the place but didn’t get a chance to stop and look around until more than a decade later, when he was invited by his coworker to the Saturday evening discussion group. “At the time I didn’t want to attend a group in regards to spiritual development. I thought it was more of a personal journey,” says Chris. It took several more months of asking before he finally accepted the invitation and that’s when he discovered how warm and friendly everyone was. He didn’t return again for several more months and was amazed to find that everyone at St. Francis remembered his name and the details of his life. By 2004 he was a regular at St. Francis, and when the director position became open, he was asked to apply and was hired. But it was the question he was asked a few weeks later, by one of the co-founders and board members’, Dr. Shyam Kashyap that really floored him. After one of the regular Wednesday meditation sessions in the chapel, Shyam (pronounced “Sham”) asked Chris if he wanted to become an Eastern Orthodox priest. “It was startling,” he says, describing how he felt at being asked that question. It was that same night, however, that Chris says he was reawakened to his spiritual calling. As a boy he had been raised in the Roman Catholic Church. In his own spiritual journey, he later became a Nazarene, then Methodist and afterward a Presbyterian. He now feels grateful for those experiences. “I saw many people who identify themselves as Christians. I saw a lot of common denominators, and only minor differences in beliefs.” Chris answered the call, and in the fall of 2011 became an ordained Eastern Orthodox priest. For additional information about St. Francis of the Woods Spiritual Renewal Center, call (405) 466-3774 or email Chris Contreras at chrscntrrs60@gmail.com.